darkSpyro - Spyro and Skylanders Forum - The Legend of Spyro: Dawn of the Dragon - Is Legend of Spyro: Dawn of the Dragon is better than Skylanders? darkSpyro - Spyro and Skylanders Forum > The Legend of Spyro: Dawn of the Dragon > Is Legend of Spyro: Dawn of the Dragon is better than Skylanders? Legend of Spyro or Skylanders? Well, I personally think so as a big fan of the TLOS trilogy, though Skylanders is a lot of fun too, though if you mostly want to play a game about Spyro, Skylanders is not the route to go. Also depends if you like edgy storylines, or kindhearted storylines, etc. I'm not fond of LoS and I think everything about it, from gameplay to story to voice acting, is derivative and mediocre at best. By contrast, Skylanders has a lot of unique gameplay and creativity, is more fitting to the tone of the franchise, has better/more music, and is a great homage/spiritual successor to the original games. Hah no. If designs are going to make you mad(they shouldn't) then no one can help you, but for the experiment that it was even SSA is better than DOTD. Less glitches, less plot holes, less widespread edginess, and a lot more fun from mashing the buttons. And from the following games(though YMMV on that) it only goes up with the gameplay. Both games(or even series) are way unpolished in many regards,but Skylanders has a lot more heart to it instead of Étrange Libellules' rather laughable attempt at making Star Wars with dragons. And Spyro isn't pink nor Cynder has a twig waist in Skylanders. Whatever definition of ugly you have,mine doesn't apply to them. You can fly higher in Skylanders than in DotD and Skylanders doesn't reuse most of its music from the games that came before it. The best Spyro flight mechanics were in the Insomniac games, though. Also there isn't free flight in DOTD either. Invisible walls and convenient wind currents are abound. And from Skylanders Swap Force foward,there is free jumping, and flying powers usually grant some defense against energy waves and whatnot, more than what DOTD's slippery controls could allow. well why did they make Spyro and Cynder Ugly? They're not ugly at all, just different. To be honest,that very first screenshot of Spyro's Adventure was a real bad idea because it showed poor Skyro with his earlier textures and in a strange angle. And as for Cynder, the beak mouth seems to be a characteristic for I-Wei's female dragons in general, and the... scale plates were corrected after the first game or at least lessened. They look much better after the first game if that's any compensation, you just have to actually look for footage. I'd personally pay the first Skylanders game over Dawn of the Dragon any day, for reasons that I posted on the review topic in this section a while ago. Not gonna lie, not a huge DotD fan, A New Beginning is okay and The Eternal Night is decent though. I prefer Skylanders in nearly every way. DotD might have free flight, but it's almost pointless with those wind currents and invisible walls everywhere. Skylanders is way darker when you put your mind into it even if the games themselves make it subtle and under much sillier filters,DOTD might've had the apocalypse and all the edgy things teenagers love but Skylands had several reported genocides and villains that got way crazier ways to end the world - for example,turning everyone Undead to break the balance of the elements seems to be a popular idea, killing every Portal Master currently existing another. Also if you're still unconvinced, you don't need to just play the games. You caaan wait for the reimagining of Dawn of the Dragon in comic form that's coming out in two weeks(this is just the compilation of the 3-part comic that's starting on the 18th). Not too bothered by either of them really. Skylanders isn't my thing, I don't mind Dawn of the Dragon, I don't really want to say that either is better, because I haven't played Skylanders, and I've got no intention to. There are a couple of levels in Dawn of the Dragon that I think are quite good, the Valley of Avalar being a good hit. But I wish it's name didn't mention "Avalar" because that's a reference to the old Spyro series which has nothing to do with LoS at all. Names are just names, the Skylanders novels namedrop Summer Forest when talking about Spyro's origins and some other LOS locales even show up in backstories; it doesn't matter if it has something or nothing to do with Classic because references never have to be restricted to the same games. I think the two are vastly different and in some ways it's a matter of opinion. I think Skylanders was easier and your hand was held a lot more, and if you're looking for a Spyro-centric game I definitely wouldn't recommend it over DotD or the other Legend games. But it's also got nice music, fun levels, and a nice atmosphere overall (and personally I think Spyro and Cynder's designs are cute?? oops). And Hunter may have been a character in DotD, but be real. He was totally remade to the point he was unrecognizeable - Auric the bear, who's a really clear Moneybags expy, is a better shout out to the original trilogy than he is. That being said, Legend has a great storyline and really nice graphics, and Spyro is much more at the center of it than he is in Skylanders, where he felt more like a marketing scheme than anything else honestly. I think ANB and TEN are better games in general than DotD, but the entire series is a nice play and I personally find the button mashing style combat kinda fun? ^ I'm with you on all of that, except that I do like the Skylanders figures. It's just a royal pain to constantly have to switch them out instead of the game just saving your characters so you don't have to drag out a huge box full of toys just to play one game. The 3DS games all save your characters,though the first two only do that two at a time. And it's probably way too expensive for most people,but there's the Biogenik expansion of the portal that allows for you to switch between 8 in the console games. I like switching them out normally but if I'm doing really badly in the game it definately starts getting tiring depending on where I play - usually when I'm with friends it stays across the room, and we all die a lot when doing co-op. I would like to LOVE it, but because of its small issues, I'm stuck on "like." Don't listen to anyone in this thread. OP played DOTD and clearly prefers it, and refuses to play Skylanders. It's the entire point of the thread to convince him otherwise. Well there's two assumptions that I can't see any proof of. The entire point of the thread is to give her an opinion, and the best way to get an opinion is to make one yourself. Just read OP's posts, there's your "assumptions". Also obvious misinformation on the second series, so if they don't care to look up songs and gameplay how would they just pick up that game and play. Just read OP's posts, there's your "assumptions". At no point does OP state whether or not she has played either game. She has only stated ideas and opinions she has about the two games. I (essentially) haven't played either game, and yet I share many of the same opinions that she has (barring the music, but only because I've only heard two songs, the ones you posted, one of which I like and one of which I don't). Also obvious misinformation on the second series, so if they don't care to look up songs and gameplay how would they just pick up that game and play. Those "obvious misinformation"s, other than the free-flying and -jumping, are opinions. You have your own opinions about the games and are standing up for and defending them, which is great, but you are kinda dumping on the opinions of people who disagree with you, which is completely uncool. "The game has no jumping". That's an opinion? So if I close my eyes and believe that SF and TT don't have jumping,or that SSA doesn't have a dark story, it'll all be true? The OP isn't even around anymore, I'm done trying to argue. With this logic you can't reach any conclusions,and if we had to play every game to have an opinion on it I'd probably be the biggest casual trash on Earth. There was stuff about how Skylanders is bad and not looking up a single video about it, but I guess we can't have that either. "The game has no jumping". That's an opinion? So you're just going to completely ignore the fact that I specifically pointed that out as not being an opinion? But whatever, you're right. Going on isn't accomplishing anything and is derailing the thread, so let's agree to disagree and leave it at that. LOS TILL THE END! I personally think gameplay and storyline is just more superior aS I find skylanders often quite boring. Eh, honestly when people call "Spyro" ugly, it makes me think they're not avid fans, not saying you aren't.. But does it matter? Judging on how someone looks doesn't change anything about them, does it? It doesn't matter what Spyro looks like, he's still the same dragon. To be honest, I think they've changed his personality in these later games, I prefer him in A Hero's Tail, I liked that a lot. Dawn of the dragon is my favourite all time Spyro game. I like dark storylines, deep character development and the awesome powers they had. Flight was the main feature I found to be amazing. It's so peaceful when gliding through levels like avalar and twilight forest, heck even burned lands after killing all those painfully tough enemies. The music is a 10/10, just turn down effects a little and listen to the beautifulness that is sound... I wish you could change difficulty though as some parts are too easy and others are extremely hard. As for Skylanders, I don't consider it a spyro game... At all. Sure it has the dragon in it, but Activision needed to put him somewhere so they decided "let's make a new franchise that has spyro as one of the characters!". I'm not saying skylanders is a bad game, I obsessed over it for a long time. But, the fact that you have to buy every... Single.... Freaking... Element in order to complete the game bugs me. I literally only buy them if they're on sale. In saying that, the storyline, although childish at times, is rather enjoyable. As are all the characters and their different personalities. I think Kaos is a well developed villain and the level designs are brilliant. I will say not being able to jump annoys me though. Overall if we are talking favourite out of the two, I would choose Dawn of the Dragon. Although i still would recommend skylanders for those who enjoy comedy/adventure games. I wouldn't say DOTD reused most of its music. I thought that it was fitting when music was reused, though. For me it made the series feel more cohesive (which was needed since DOTD was made by different people). I do agree about the Insomniac flight mechanics, though. I'm not saying skylanders is a bad game, I obsessed over it for a long time. But, the fact that you have to buy every... Single.... Freaking... Element in order to complete the game bugs me. I also don't see Skylanders as a Spyro game, either. Rather its just a game with Spyro as a playable character (and a game I personally wouldn't want to play, though I do own it... and the sequel- it was a gift but I've never played it.) I think, as many others do, that Skylanders is gimmicky with the whole "buy more toys" thing- though I guess it has been pretty successful for them so far. Is it bad that I want them to start losing money so that we can finally have a Spyro game that isn't Skylanders? Well, I agree they should stop with the Skyanders, but if they loose money, wont that be an overall problem for the company? They would probably just make ANOTHER Skylanders game that is 'better' than the previous one. Guys, think about this.If they start losing money they'll blame it on the Spyro IP and throw it in the limbo where Crash is now. Just ask any dead mascot whose flopped game was someone else's fault entirely - that INCLUDES Crash but can apply to so many other franchises. Wanting a franchise to fail just because it has your character on it is kind of too much hate, really. And they haven't forgotten about Spyro in the canon, he's already been the protagonist in the Malefor comic arc and will be in the Trap Team finale and the graphic novel prequel to the next game. It only takes Activision seeing the potential in giving ANY of the Skyladers a game of their own, because that's something the fans have been asking for a long time, for Spyro and for a load of other guys with interesting stories to tell. I was mostly joking, but yes you guys are right. I feel like Skylanders is holding Spyro back, but I also know that a lot of people do like Skylanders, even some Spyro fans. I would love to see another game like The Eternal Night or A Hero's Tail, but I'm sure that won't happen even if Skylanders does ever end. The solution might be to have both. Acti already throws the IP around betweeen 3 dev teams,just get one more to make individual adventures with Spyro and whoever else has good gameplay for one. I love this idea! If this happens one day, I'll be excited for new Spyro games again. Basically, and short story is, is that if you like playing dark, gritty, 'button mash' combat systems, but still has a bit of an emotional feel to it, then you'll enjoy DOTD, but if you like playing games that are bright, colourful, collecting somewhat-pricey toys, and more of a happier-toned environment gamne, then I'm pretty sure you'll enjoy Skylanders as well. Both of them are vastly different. 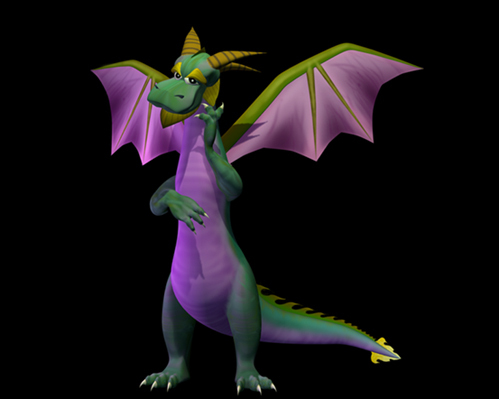 Skyro and Spyro are two different characters completely, even if it may include Malefor and Cynder and whatnot, their stories are not very relevant to the old games or the newer ones, even with a few hints here and there, it's a completely different universe. Pfft happier toned. I'll sound like an angry newcomer even if I've been in the fandom for a long time,but Superchargers does incoming end of the world drama much better than DOTD,and the world doesn't even get close to ending. Resources and never staying in one place because of the reality-eating rifts and sky pirates attempting to take advantage of the panic is brought up frequently. You need to remember this though, is that Skylanders is meant for kids. Kids don't understand the dangers or the lore. It's like the same gag all over again basically: Evil takes over, before good wins once again. If it's a kids game that's meant for kids, then I'm leaving it as a kids game for kids! I don't want these kids games ripped away by the older audience claiming it as theirs because of a sudden dark lore. I don't mean to sound rude, or mean in anyway, but why is it so hard for people to understand this concept? What am I going to do? Tell a kid that everyone in the [fictional] world is dying if you don't do something? Hell no, it'll not only break their heart, but also really ruin the game for them. And DOTD is what? Evil takes over,good guys win once again. It doesn't even have the depth of characters having to take sides to let things go haywire, try the last bit of hope that everyone has real dread of going nowhere, or where their friends' loyalties lie and should it be followed or not like Superchargers(any more detail is major spoilers and it's too soon to spill the beans) - Cynder gets forced into evil,but nah,love is stronger, that's it. You don't need to use words to hide it from a kid. It's as simple as ' the entire world is being torn apart', or killing an inanimate robot-like character in the prequel comic - they won't think of it,but when they grow up,they'll look back at it and realize how intense the situation really was. Kids doesn't equal dumb, just like E10+ doesn't mean smart. Because DOTD is very silly and cliche in how edgy it tries to be. This is by far the best LoS game in my opinion, but... Hahahaha no. Sure it's better than the mobile games, maybe the 3DS games and the weaker mainline entries (Superchargers/Giants), but not every game in the series. And if you compare the LoS and Skylanders franchises as a whole, Skylanders blows LoS out of the water- more entries, more consistent quality, more bonus materials like books and merch, better stories and considerably better gameplay.